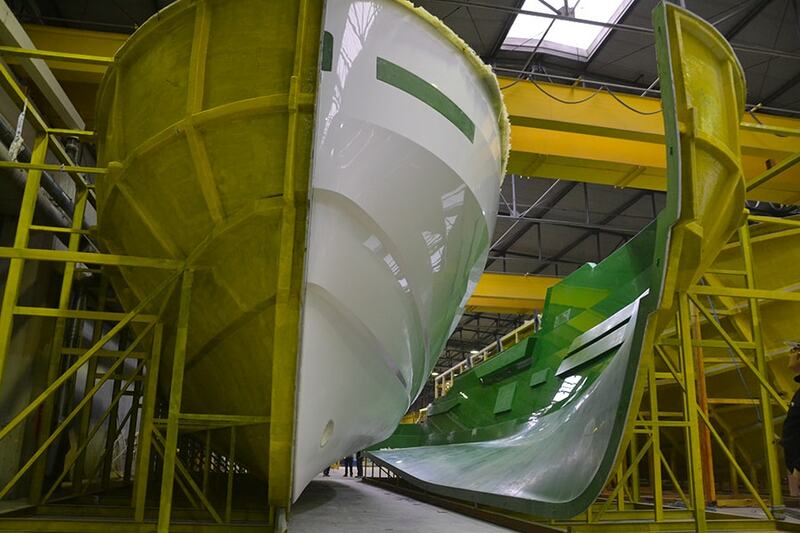 The construction of the first SHERPA XL is proceeding rapidly and is entirely on schedule. The new yacht of the Italian shipyard will be yet again an innovator and a turning heads model with features typical even of the world of 85-90 footers. Its international debut will be at the Cannes Yachting Festival 2019 (10-15 September). The areas on board the new SHERPA XL yacht make the best use of the vessel’s 24 metres of length and especially of the beam, which is nearly 7 metres (compared to the average 6.3 metres of the 85-to-90-foot yachts on the market), offering an incredible 220 square metres of interior and exterior living space. 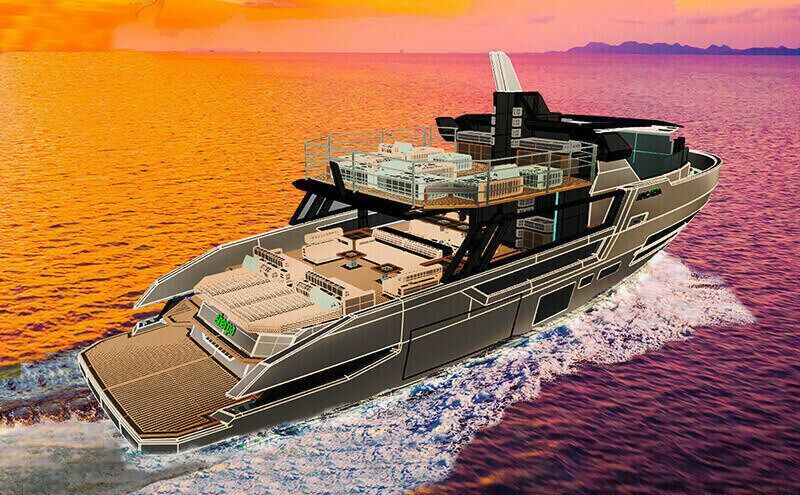 The concept of the SHERPA XL yacht, developed in collaboration with the Milan-based Hot Lab design company (which has already worked with ARCADIA YACHTS on the A105 projects), develops around the layout of the decks. The bow decks are split to develop a central flight of stairs with small differences in height. This particular ‘jigsaw’ layout provides considerable space in a relatively small height, which allows to obtain interesting results with volumes. The topsides along the whole cockpit have designer openings that allow guests sitting on the sofas or at the table (large enough to host between eight and ten people in the optional version) to fully enjoy the view. The “trait d’union” between interiors and exteriors, which highlights the relationship with the sea and the surrounding environment, is definitely the skylounge (34 m2), where the up&down windows allow guests to enjoy the sea breeze by simply touching a button. On the upper deck, with a 35 square metre sunlounge, a bar area stresses the open-air philosophy of the SHERPA-XL. Unlike traditional fly deck arrangements with an exterior helm station, this area is dedicated entirely to guests and their privacy. The regular shape of the sunlounge means that multiple solutions are possible with “loose supplies”. The master suite is over 22 square metres in size and extends into the bathroom, with no dividing partitions, which allows the owner to enjoy an almost home-like setting - large, open and full of light. The VIP cabin in the bow follows the same principle, successfully broadening spatial perception in an almost theatrical manner. The standard engines are twin Volvo Penta IPS 1050 main engines (although it is possible to install two IPS 1350 engines, as in the first unit currently under construction). The yacht can reach a top speed of over 20 knots. It has great autonomy - at 12 knots, the SHERPA XL yacht can sail for over 1,000 miles, using up to 30% less fuel compared to other yachts in the same and 85-to-90foot class. If the speed is kept at 10 knots, the vessel’s autonomy is over 1,500 miles. To minimise environmental impact with renewable energy sources, SHERPA XL is equipped with ARCADIA’s trademark solar panels, which provide up to 3kW of clean electricity (sufficient to power all on board systems except for the air conditioning). Additionally, the yacht is fitted with lowconsumption appliances and led lights.